Home » How to Stream ISO Images to Apple TV 4 on Mac? An ISO file, often called an ISO image, is a single file that's a perfect representation of an entire CD, DVD, or BD. The entire contents of a disc can be precisely duplicated in a single ISO file. Normaly, if you want to play an ISO file that you've created or downloaded from the Internet on PC, you need to mount ISO. Mounting an ISO file is sort of like tricking your computer into thinking that the ISO file is a real disc. But this way can't be used on Apple TV 4, which means that even though you mount ISO, you still can't play ISO on Apple TV 4. Apple TV 4 lets you stream all the video content in the iTunes Store to your HDTV, with purchases stored in the cloud. Netflix, Hulu, HBO, YouTube and dozens of other online services are available, plus music, videos, and photos can be streamed from iOS devices using AirPlay. 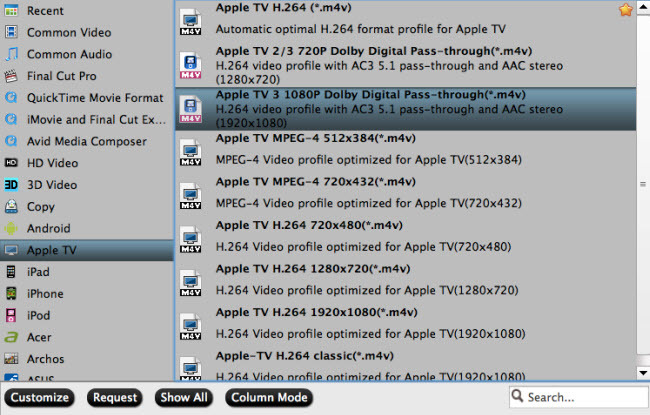 But the drawback is that all the media files in Apple TV 4 media library must be in the format that ATV is compatible. From the below list of ATV playable video and audio, we can learn that ISO is not supported by Apple TV 4. When we know what files Apple TV 4 can play, we know we have the chance to play ISO on ATV 4 only if we make ISO be the one file that ATV supports. To make it simple, we convert ISO to .m4v, .mp4, and .mov format video in H.264/MPEG-4 codec, we can play ISO on Apple TV 4 via iTunes or AirPlay. To rip ISO file to Apple TV 4 friendly format, a powerful and user-friendly ISO ripper is more helpful. Pavtube ByteCopy for Mac has a powerful decryption ability to deal with different kinds of copy-protected ISO encryption technology. You can use this ISO Ripper to conver ISO to H.264/MPEG-4 .mp4 .mov .m4v for Apple TV 4 streaming. You can convert video to 2160p, 1080p, 720p resolution and compress 4k video to 1080p. If you create ISO from Blu-ray, you also can keep Dolby Digital 5.1 and Dolby Digital Plus 7.1 audio from the original Blu-ray videos for Apple TV 4. You also can convert ISO to other devices or media players such as Plex, Playbook, etc. It is very easy to use and has especially been designed to make it easier for novices to convert ISO to Apple TV 4 supported MP4, MOV, M4V format. Not everyone is tech savvy and hence, this ISO Converter ensures that the process can be accomplished without any issues. The installation process is quite safe. When this is completed, the users need to browse through their files and folders and install it. Pavtube ByteCopy for Mac works stably on macOS High Sierra, 10.12 macOS Sierra, Mac OS X 10.11 El Capitan, 10.10 Yosemite, 10.9 Mavericks, 10.8 Mountain Lion, 10.7 Lion, 10.6 Snow, etc. Read ByteCopy for Mac review. Click "Load from IFO/ISO" button to load ISO image file. All movie titles will be detected and listed in few seconds after analyzing. Meanwhile, the right main title or if it's a TV series DVD, all episodes will be marked automatically. Also, you can preview the video by clicking "Play" button on the left. You also can load Blu-ray and DVD directly to convert to Apple TV 4. Click on Format > Apple TV. 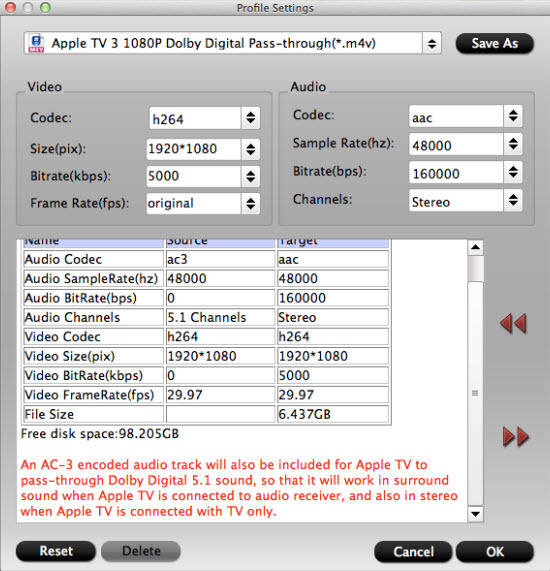 There are different optimized M4V formats for Apple TV 1/2/3/4. Choose any one you need. You can select “Apple TV 3 1080p Dolby Digital Pass-through (*.m4v)” from the drop down menu. The profile Apple TV 3 is specially designed for 1080p Full-HD quality with Dolby Digital 5.1 Surround Sound, which also can give you perfect movie enjoyment on Apple TV 4. 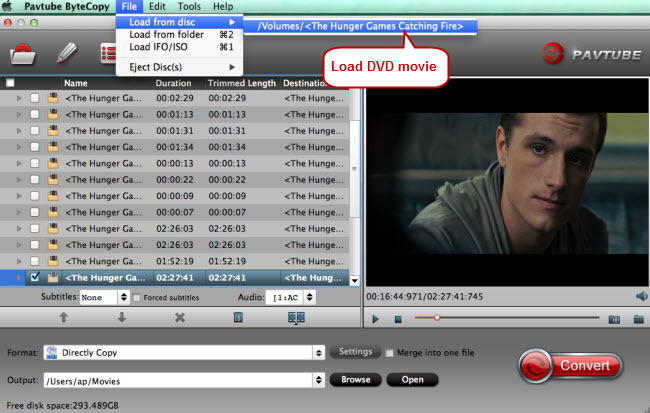 You also can choose HD MP4 and HD MOV in "HD Video" category. Now, click "Settings" to open the settings window. You can adjust codec, bit rate, frame rate, sample rate and audio channel to get more compatible video with your Apple TV 4. Once you finish the two steps above, set output path and click "Convert" button to start to convert ISO file to MP4/M4V/MOV for Apple TV 4. Meanwhile, it's a process of reducing video size from 6-8 GB to around 1 GB, so that you can save more storage space. Once the process ends, you can locate the video files on output folder. Firstly, to use AirPlay, you need to prepare one of the following devices: iPhone, iPad or iPod touch. Add the converted ISO movies to iTunes and sync to your iOS device. Secondly, be sure iOS device and Apple TV 4 are in the same Wi-Fi network; start play the video on your device, and then swipe up from the bottom of your device screen to access Control Center and tap AirPlay; finally, tap the name of the device you want to AirPlay to. Firstly, add the converted ISO videos to iTunes. Then, go to iTunes > Preferences, choose Apple TV, and make sure “Look for Apple TVs” is selected. Secondly, on your Apple TV, choose Settings > Computers > “Connect to iTunes,” and note the passcode displayed; in iTunes, select the Apple TV (below Devices), and enter the passcode. Now, all content are streamed to Apple TV for enjoyment.